This Is No Movie Folks. It’s Real and It’s Scary. I don’t enjoy scary movies. Never have. I also don’t enjoy scary “amusement” park rides. * I know I’m kind of a fluke in our U.S. culture this way. I just find that there’s enough excitement, thrills, and fright in the real world if you just open your eyes. An example of real world things to be scared of is the current debate childish tantrum in Washington over increasing the debt limit. I’ll admit I haven’t taken it seriously until now. A couple months ago I called it Kabuki Theatre of the Absurd. The law itself, the debt “ceiling” law, is absurd. It is also redundant. Raising the debt ceiling should be a like sending a form letter. Routine. Perfunctory. The law should be simply done away with. If Congress doesn’t want to borrow more money then the time and place to make that point constitutionally is when the budget is adopted. The Republicans and Tea Party types were unable to accomplish their goals of gutting Social Security, Medicare, and other programs when the budget bill was debated last March-April. They simply didn’t have the political support and they couldn’t agree on just who to cut. So instead of doing the constitutional thing and either win more elections and gain seats (they actually lost a special election in May because of their plans to cut Social Security), or waiting until the next budget for next year, they’re trying to accomplish their goals under a subterfuge. It’s not about the debt. It’s not about the deficit. If it were about debt, deficits, and “fiscal responsibility”, then closing tax loopholes for high-income folks like hedge fund managers and the commodity speculators that drive up oil prices would be an option. But the Republicans and Tea Partiers have expressly stated that even closing a tax loophole is unacceptable. Only spending cuts are acceptable. So the truth is it’s not about “fiscal responsibility”. It’s about eliminating government programs that people want as the New York Times explains today (possible paywall on link). In the 1955 movie Rebel Without a Cause, James Dean and a teenage rival race two cars to the edge of a cliff in a game of chicken. Both intend to jump out at the last moment. But the other guy miscalculates, and goes over the cliff with the car. This is the game that is being played out in Washington this month over the debt ceiling. The chance is at least 1/4 that the result will be similarly disastrous. The game is not symmetric. The Republicans are the ones who are miscalculating. Evidently they are confident of prevailing: they rejected the President’s offer, even though he was willing to cut entitlement programs. The situation is complicated because there are a number of different people crammed into the Republican car. There is one guy who is obsessed with the theory that, come August 3, the federal government could retain its top credit rating if it continued to service its debt by ceasing payment on its other bills. But this would mean failing to honor legal obligations that have already been incurred (paying suppliers for paper clips that have already been bought, paying soldiers their wages for last month’s service, sending social security recipients their checks, etc.). This is like observing that the cliff is not a 90 degree drop-off, but only 110 degrees. It doesn’t matter: the car would still go crashing into the ocean far below. The government’s credit would still be downgraded and global investors would still demand higher interest rates to hold US treasuries, probably on a long-term basis. There are other guys (and gals) in the car who are even more delusional. They are dead set on a policy of immediately eliminating the budget deficit (e.g., those opposed to raising the debt ceiling no matter what, or those campaigning for a balanced budget amendment), and doing it primarily by cutting nondefense discretionary spending. This is literally impossible, arithmetically. But they honestly don’t know this. It is as if they were insisting that the car can fly. Sometimes it can be a good bargaining position to adopt a very extreme position. But if you are demanding that the car flies, you are not going to get your way no matter how determined you are. It seems likely that the man in the driver’s seat – House Speaker John Boehner – does realize that his fellow passengers don’t have the facts quite right. But there is also a game of chicken going onwithin the Republican car. The crazies have said they will oppose in the next Republican primary election any congressman who votes to raise the debt ceiling or to raise tax revenues. (Yes, they think they would support someone who would eliminate the budget deficit primarily by cutting non-defense discretionary spending; but remember, this is arithmetically impossible.) The guy who is riding shot-gun in the car – the one who believes the car can fly — is trying to put his foot on top of Boehner’s on the accelerator pedal. Yes, people who cannot do basic arithmetic are in charge here. And they’re throwing a childish tantrum because they can’t get their way. Only unlike a child who’s threatening to hurt themselves if they don’t get their way, these folks could potentially take us all down. Or the President could, as we and others have suggested in the past), simply invoke the 14th amendment and refuse to enforce a statute that he believes violates the Constitution. Professor Scott Fullwiler has suggested an even more creative way around the debt ceiling: Fullwiler notes that Fed is the monopoly supplier of reserve balances, but that the US Constitution bestows upon the US Treasury the authority to mint coins (particularly platinum coins). Future deficit spending by the federal government could thereby continue to be carried out by minting coins and depositing them in the Treasury’s account at the Fed (for more details see here). Curiously, the President won’t pursue any of these options. These options would keep financial markets on an even keel but could provoke a constitutional and legal crisis as the Tea Party types would not doubt file endless lawsuits challenging it. But thinking about these options is largely academic since Obama shows no inclination to exercise these options or to explain why he doesn’t. Obama shares responsibility because he’s let the Tea Party types and Republicans take this charade this far. Let’s consider a more likely intermediate case. As mentioned in another post, to immediately stop all new borrowing and instantly balance the budget, the government has to cut 40% of it’s spending right now. The federal government accounts for $3.8 trillion of spending in 2011. GDP is expected to be in the $15 trillion range. If the government cuts 40% of that $3.8 trillion instantly, that’s a $1.5 trillion cut in spending. 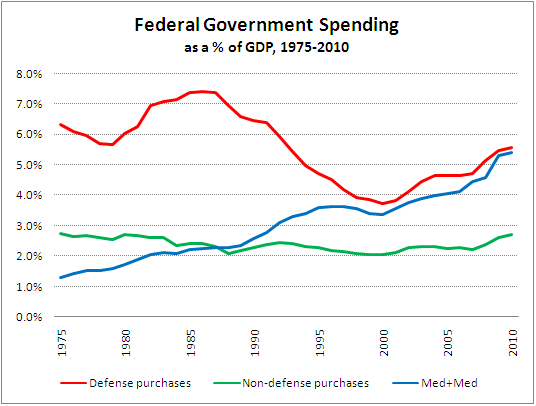 Government spending is part of GDP (despite what far right-wing types believe). So an instant balancing of the budget on Aug 3 means a 10% cut in GDP. 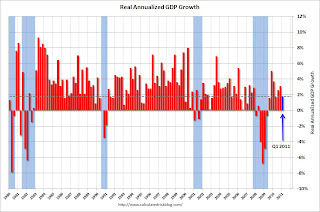 When the economy collapsed in 2008 it was only approximately a 5% drop in GDP. So the “intermediate” case of default is an instant recession twice as big as the “Great Recession” of 2008. Apparently the Republicans and Tea Party types loved 2008-09 and the bailouts so much they want to repeat it and double down. Now what’s the worse case? Well add into the scenario a financial crisis to dwarf 2008. See US bonds are AAA rated because there’s no chance of default. If there’s a default, or even a slight increase in the possibility of a future default, then pension funds, banks, and central banks around the world no longer have safe, interest bearing assets. Chaos. Pension funds have to sell bonds. Bond prices drop. Interest rates rise. Banks lose capital as the bonds fall in value. Nobody knows which banks are worst off. A mess to make 2008 look simple. And guess what, we’ll be back to bank bailouts only with even more unemployment. Why can’t we have grown-ups in Washington? These kinds of scary scenarios should be fictional and in the movies. It shouldn’t be national policy to deliberately default and crush the economy just to make some political policy victory that you couldn’t win straight up. I missed posting this a few days ago. Bureau of Economic Analysis says first revision of the GDP estimate for 1st quarter 2011 was essentially unchanged from the initial “flash” estimate provided at the end of April. The U.S. economy grew at approx. 1.8% annual rate. While the overall growth rate was unchanged, there was some shuffling among the categories. The revised numbers indicate that consumption spending (C) was weaker than initially thought, accounting for only 1.53 points of GDP’s 1.8 percent growth rate as opposed to the original 1.91. Offsetting this lower estimate of Consumption spending was a larger than originally thought increase in Inventories (part of I, Investment spending). This is not a good sign. It says that consumers are slowing their spending more and that as a result firms ended the quarter with more inventory than expected. That tends to signal an economy slowing more than businesses had expected. continuing cuts in government spending at all levels. State and local governments in particular are cutting a lot. Congress and the President have evidently decided this year that it’s more important to cut government spending and borrowing (despite less than 3% interest rates) no matter how much it slows the economy and raises unemployment. Together state, local, and federal government cuts in spending reduced GDP growth rate by 1.09 points. In other words, if we had simply continued spending at the existing rate instead of cutting, we could have had at least a 2.9% GDP growth rate. Europe is having a lot of difficulties with their ill-designed monetary union and their ill-advised austerity policies. Europe is slowing dramatically and some countries are falling back into recession. Not good for overall global growth or U.S. exports. China is struggling to contain it’s inflation and may need to slow down it’s growth rate. and most significant, unemployment and wages continue to play out a depression for workers. Though there seems to be a concerted effort to get people to believe otherwise, Social Security has very little to do with our long-run budget problem. The only people with a serious interest in undermining SS are Wall Street. They should be hung, drawn and quartered. Political reform is desperately needed in America (as is an informed, critical public and more transparence – but one thing at a time). Great Graphic. This graphic should be posted once a week and used as widely as possible to educate the media and the politicians. SSTF is a huge pot of money. Wall Street salivates at the thought of collecting fees on $Trillions in long term investments. The deficit increased over the last 2 years, but it wasn’t because of any “surge” or “explosion” in government spending. It was because the real economy, which generates the tax revenues, collapsed because of a financial crisis, as the following graph shows. It wasn’t an increase in govt spending. Spending continued to increase at the same rate as it did during the “boom” years of 2005 and 2006. Instead, when the financial crisis on Wall Street in 2008 spilled over into the real economy it collapsed tax revenues. Fiscal stimulus to drive recovery really hasn’t been tried yet on a scale commensurate with the problem. In this graph, the gap between the blue and red line represents the deficit. Yes, it got bigger in 2008, but it’s because tax receipts dropped. So how did that $780 billion stimulus bill of the administration that passed in Feb 2009 disappear? Easy. First it wasn’t $780 of spending. It was a little over $400 billion in spending over 2.5 years. The rest was tax cuts. Second, it was only Federal government spending. At the same time, state and local governments and school boards cut spending. Net: no change.